You shouldn’t rely on the first impression to evaluate the quality of the brake pads. For optimum performance, you should allow some time for the brake pads and brake disc rotors to be properly bedded-in. This is also known as burnishing or break-in. In other words, to allow the brake pads to bed-in means to create an even layer of the friction material on the brake pads on the rubbing surface of the brake disc rotor. Bedding-in procedures may differ for various brake systems, friction materials, and driving conditions, hence, it may not be easy determine the time and distance required for the brake pads to be properly bedded-in. 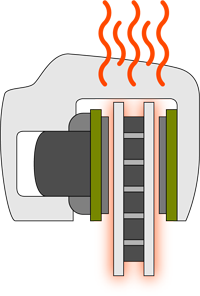 If your brake pads are overheated (more than 450°C) for long period of time due to reasons like unnatural racing driving, caliper mechanical problems, driving with hand brake, then it is highly possible that performance of your brake pads will be downgraded. The braking power will be reduced. It caused by burning of heat sensitive components in the friction material.